Columnist Kate W. Hall embarks on an interesting journey. Luckily, our three kids – ages 13, 10 and 8 – never made mention of that third item, having never been exposed to it in their lifetimes, and we got out of that difficult conversation for now. I was still a little nervous about the event, though. I had my doubts as to how this “pop punk” band my teenager and 10-year-old were obsessed with was going to both 1) spark my husband’s and my forty-something musical interests and 2) maintain my 8-year-old daughter’s attention for two hours or more. The oldest had worked on us (read: begged) to go to this concert for weeks. At the last minute, we threw a punk Hail Mary into what seems to us like the silent teenage abyss. We said yes. You see, we’re new to this teenage thing. The “mmm hmmms,” “yeahs” and “whatevers” peppering our conversations over the last few months had us a little concerned. Whatever were we going to get this kid to talk about? Fall Out Boy, the band we’d traveled to see, opened up with bright lights and a beat that would have roused even the biggest of fuddy-duddies. I looked to the left to see all three of my kids literally standing on their seats, mouths open and dancing as best they could without losing balance. It was LOUD – and I mean LOUD – and we were almost in the last row of seats before the sidewalk separated those of us under cover from the swarms of kids hovering close to the rope on the lawn. The band members were stellar at connecting with their target market. “We’re so F-ing happy to see this huge crowd! 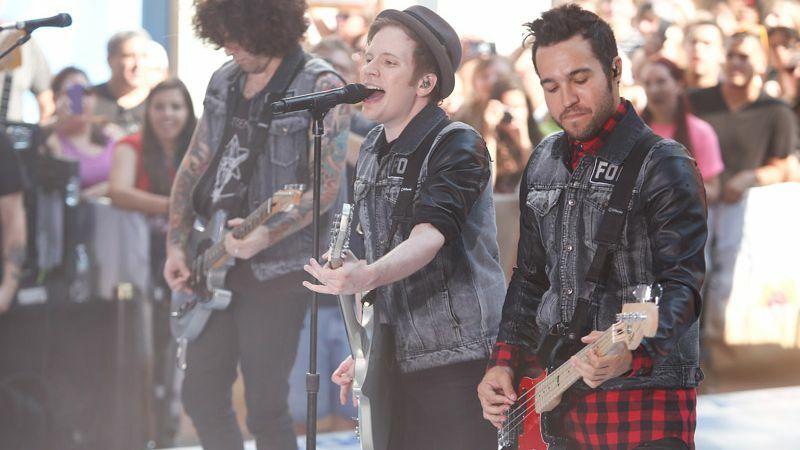 We love you!” and, later, “Don’t ever let anyone F-ing bully you!” the bass player, Pete Wentz, shouted. All I could think in my mom-voice was: Really, really, do you have to use an expletive every time you address the audience? Then, the 19-year-old girl in me who’d followed the Grateful Dead, seeing, hearing and quite frankly smelling things far worse at grungy shows many years ago, began to giggle and relax a little more and take it all in. These four rockers had an insane amount of energy. The lights and dancing crowd only seemed to boost it – especially when tons of inflatable balls were released over the audience, big bubbles we could all touch, feel and see, connecting leather-clad mohawked teen and pony-tailed suburban mom. The hands on the clock were racing. The lights on stage went out and I realized the encore was near. So I took my little one’s hand to give her some time to settle down as it was very late (this was one of those tough calls where she didn’t want to be left with a sitter). We checked out the (largely inappropriate) T-shirts while we waited for my husband and the boys, and she said, “Mama, I made it through my first concert!” The boys made their way to us ahead of the massive sea of concertgoers, high-fiving and talking about how they couldn’t wait to Instagram the videos they’d snapped to share with their friends. My husband and I shared how surprised we were that we loved the band. The chatter continued as we climbed into the family SUV and headed back to the hotel: clamoring to ask each other which song was our favorite, who loved the drum solo, and how amazing we thought the venue was. The teen was even slightly animated! OK, he smiled big enough so we could see his braces once or twice. As we lay in our little hotel room, I listened to the breathing of each of my unique little family members. I stayed awake a little longer – savoring this rare moment for my family, which is usually on a hamster wheel running in five different directions – and hummed a Fall Out Boy tune. Then I feel asleep, happy.